Austrian Hebraist; born in Vienna 1783; died at Prague May 22, 1853; son of Moses Fischer, rabbi of the Jewish community of Vienna. He wrote in Hebrew an able and comprehensive work on the his tory of the Jews under Mahdi and Imam Idris, kings of Mauretania, entitled "Toledot Yeshurun Taḥat Malke Moritaniyya," Prague, 1818. 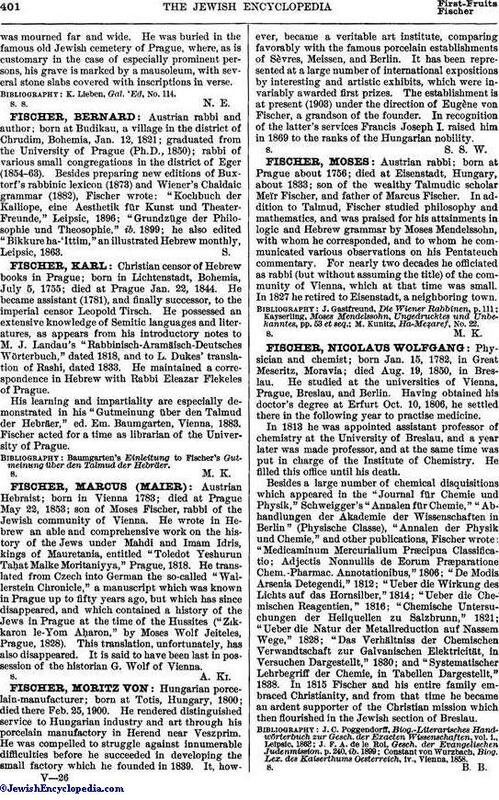 He translated from Czech into German the so-called "Wallerstein Chronicle," a manuscript which was known in Prague up to fifty years ago, but which has since disappeared, and which contained a history of the Jews in Prague at the time of the Hussites ("Zikkaron le-Yom Aḥaron," by Moses Wolf Jeiteles, Prague, 1828). This translation, unfortunately, has also disappeared. It is said to have been last in possession of the historian G. Wolf of Vienna.